The Equilibar® EVR series of vacuum regulators are an inherently quick reacting design that automatically compensate for fluctuations in the system flow rate. This offers real advantages over traditional vacuum control valves (for example, a butterfly valve) that rely on an external control loop and I/P actuator. In many cases the disturbance in the system has already passed before the control valve has even responded. With the Equilibar EVR series, response is immediate, just a few milliseconds, and occurs automatically without the need for a sophisticated control loop. The Equilibar vacuum regulator is able to respond quickly because it utilizes a pilot operated design with a flexible diaphragm membrane as the only moving part. A pilot setpoint command vacuum pressure signal is applied to the top of the diaphragm. The diaphragm then lifts and connects the vacuum supply to the system. 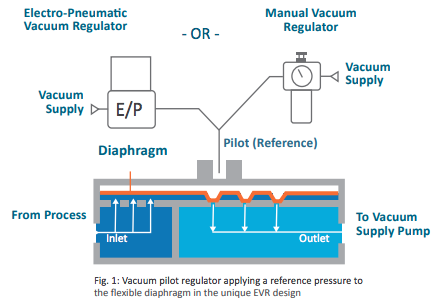 Once the vacuum level in the system is equal to the pilot setpoint signal, the diaphragm becomes balanced and will begin throttling the flow from the system to the vacuum supply. The flow rate will be automatically limited to exactly the amount that is required to keep the system vacuum pressure equal to the pilot setpoint vacuum level. If the flow rate into or out of the system is suddenly increased or decreased, the diaphragm will instantly be moved to the position required to match the new flow rate, thus keeping the vacuum pressure at the desired setpoint. This occurs because the pilot pressure on the top side of the diaphragm does not need to change in order to move the diaphragm into the new position. The pilot pressure is already at the desired setpoint. It is the attempted change in the system vacuum that automatically shuttles the diaphragm into the correct position to quickly compensate for the change. The pilot vacuum setpoint pressure may be applied with a manually controlled turning knob regulator, or it can be set by an electronic vacuum pilot regulator. Many existing systems retain the traditional approach to controlling vacuum pressure by utilizing a flow control valve that features an actuator driven by an I/P converter. Usually there is some type of control loop that observes the vacuum pressure and then modulates the flow control valve more or less open (see schematic below). The flow control valve is often a butterfly design. The problem with this arrangement is that the control loop is often too slow to allow the vacuum pressure to remain at setpoint when there are changes to the flow rate coming into or out of the system. Any sudden disturbance in flow rate, or sudden loss of flow, inevitably results is a vacuum pressure spike (see graph above). To avoid the problems caused by the long response times of a traditional control valve and PID loop, a high speed Equilibar vacuum regulator can be substituted and installed in a simpler setup. See schematic below. The advantage of the Equilibar Vacuum Regulator with its instantaneous vacuum control is a faster response time. Any sudden disturbance in flow rate or sudden loss of flow results in a small vacuum pressure spike after which it returns to setpoint quickly. (see graph above). Watch the demonstration of this concept in our Equilibar Engineering Lab.